We all know that Constantin likes to make extremely challenging puzzles, but his latest design, the Labynary, takes the cake as one of the most confusing and challenging puzzles I've ever seen from him...Or anybody else! 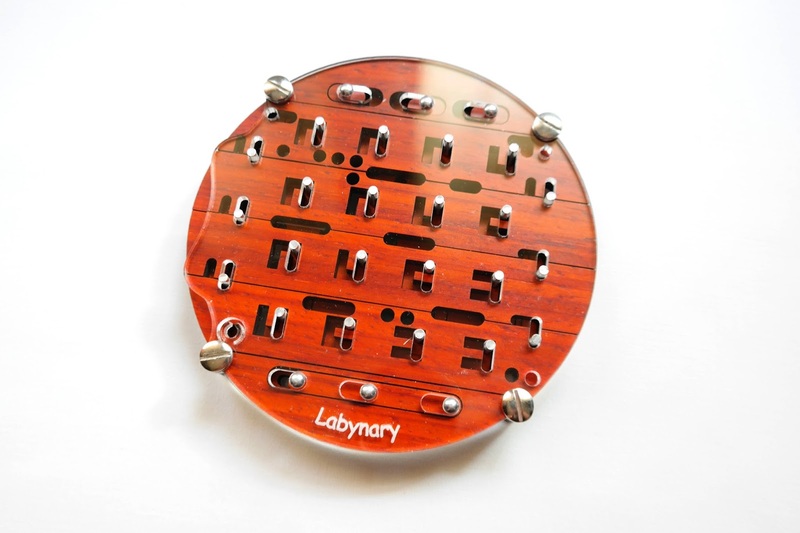 Labynary is very well built from plywood slabs and acrylic on the top and bottom of the puzzle. I like the name of the puzzle, because it cleverly uses the term "n-ary", which these sequential movement puzzles are popularly known for. 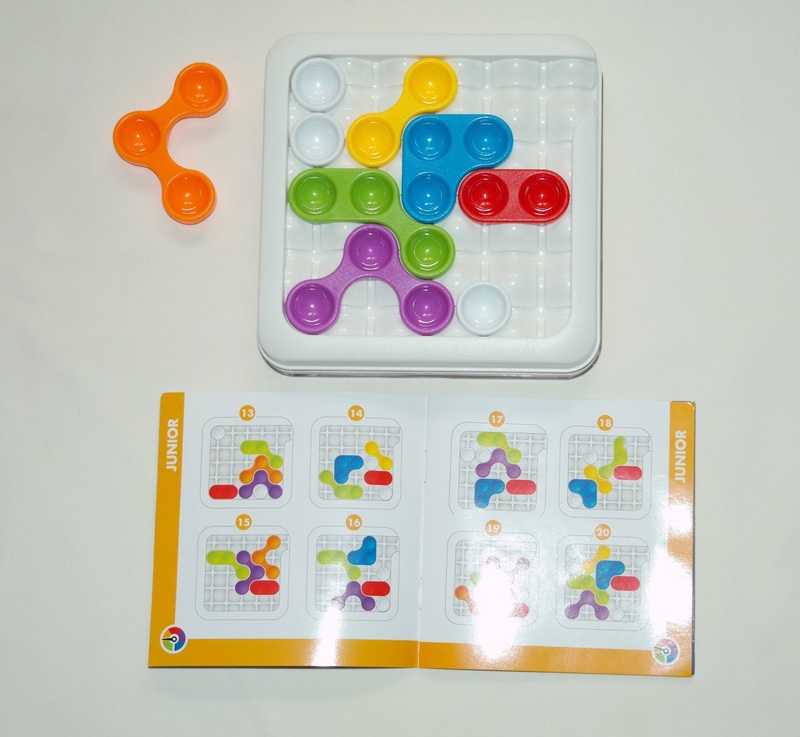 The puzzle has a circular shape, but the labyrinth inside is laid out in a 4x4 square grid. 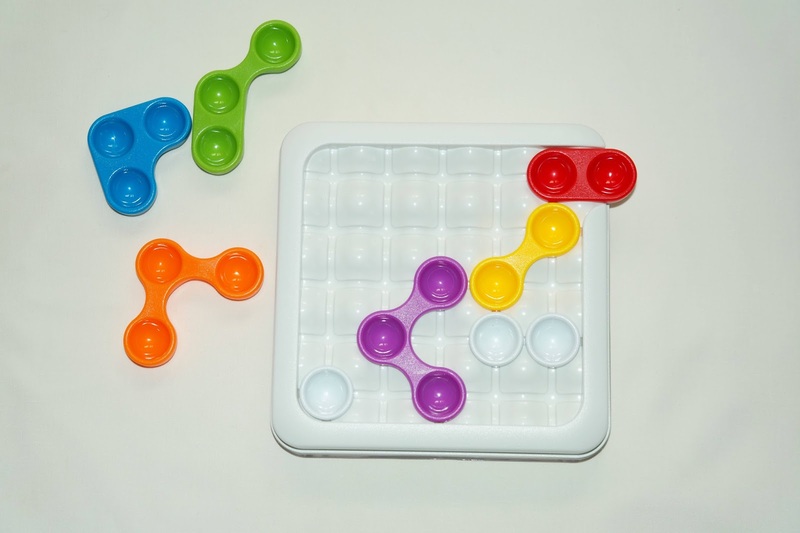 Scattered throughout the area of the puzzle are sliding pins that will lock or unlock the movement of any of the six sliding wood strips (four horizontal and two vertical). The goal is to free the metal sphere from the puzzle. The movement of the strips will allow a small metal sphere to navigate through the labyrinth and eventually be freed from one of the three exit holes. 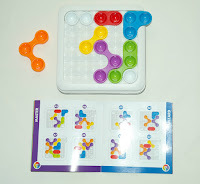 These three holes positioned at the edges of the puzzle indicate the presence of three different paths, which means three mazes, or three different solutions. Sounds complicated? It should, because this is one hell of a challenge. The Labynary will be the ultimate puzzle to test your patience levels and of course, your solving skills. Even the most experienced fans will have a hard time with this one. As a collector, it doesn't matter if it's difficult, because it's a very attractive puzzle to add to your collection. Availability: You can find the Labynary puzzle at PuzzleMaster for $62.99 CAD. 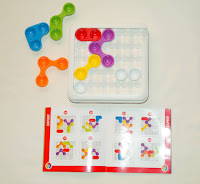 Check out other interesting puzzles by Jean Claude Constantin as well. In this day and age we live in such a fast and changing world, it's hard to take some time and get away from all the technology surrounding us. Amidst all this frenetic pace, it's quite refreshing to see a company like SmartGames delivering new games every year that don't require anything else beside your gray matter. It's often said that if something isn't broken, don't fix it. 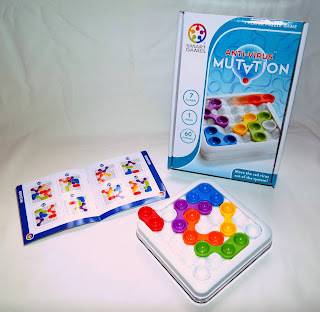 However, fortunately for us lovers of logic games, that doesn't seem to be the case with the new Anti-Virus Mutation, based on the classic game Anti-Virus by Oskar van Deventer. Instead, what you'll find is a carefully designed game by Raf Peeters, a bit more accessible for beginners, that simply took the best ideas from an already amazing game and mutated it into a very interesting alternative...or a complement, if you're like me and already own the original version. There are two major differences between the two games that makes the new version really worth considering your time and money. The first is that the board is a little smaller, ideal for travelling. Also, smaller means less pieces (6 instead of 11 found in the original), and less pieces means easier to solve. That's good if you like casual games and you're easily frustrated by difficult puzzles, but troublesome for someone looking for a tough challenge. In this case, I recommend going directly to the Wizard challenges, which could take between 10 and 20 minutes each to solve. To make it a little more challenging, there are three blockers that are placed in the board to block the movement of some pieces, so you need to get around them. 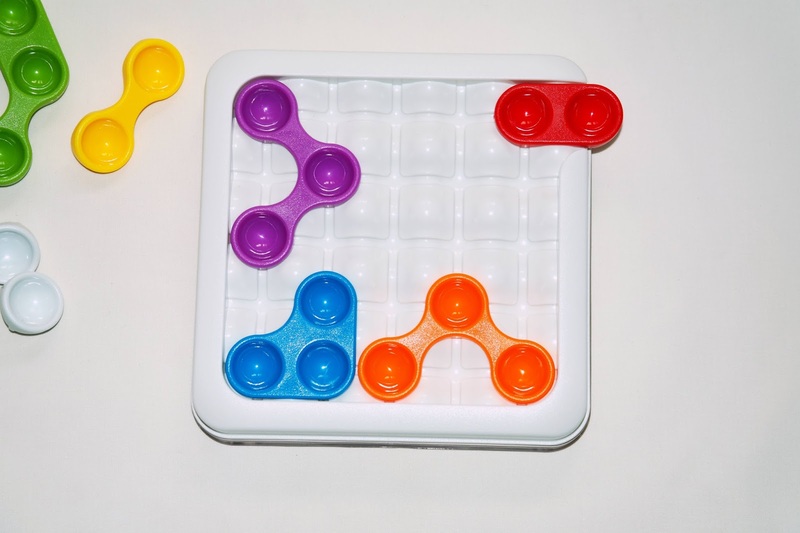 They are considered part of the game board, so you can't move them. The other major difference between the original and the new version, and most importantly, is the way it's played. The layout of the board this time consists of vertical and horizontal movements instead of diagonal. 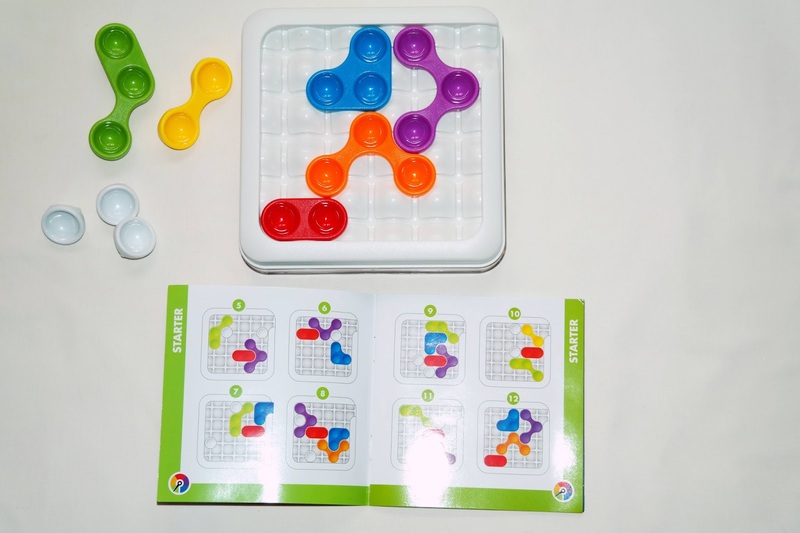 Since the pieces are moving differently, you can expect a whole new experience, which in itself is enough to justify adding this great game to your collection. Differences aside, the core gameplay is essentially the same. You need to free the red virus from the board by sliding the other colored pieces out of the way. If you've played any sliding games before, you'll feel right at home with this game as well. I breezed through most of the challenges, although I'm a sucker for sliding games and I'm better at them than other types of games. What I can say is that if you like sliding puzzles and games, I can't see any reason not to get the Anti-Virus Mutation. It's more from what you love, so it's a no-brainer. I really liked the new take on the original Anti-Virus, one of my favorites from SmartGames. The game is made with high quality materials and the colorful design makes it for a rather pleasant experience. I also liked the new packaging - It's more practical, it's sleek and easier to take with you anywhere. Can't recommend it enough. 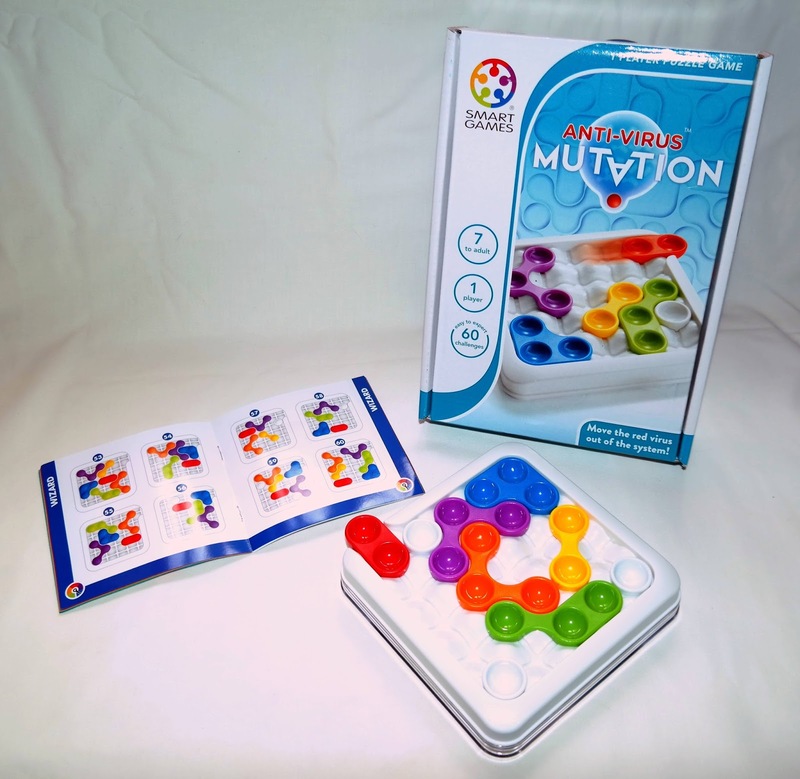 Availability: You can find the Anti-Virus Mutation on Amazon or any other major puzzle game store. This puzzle couldn't be simpler. 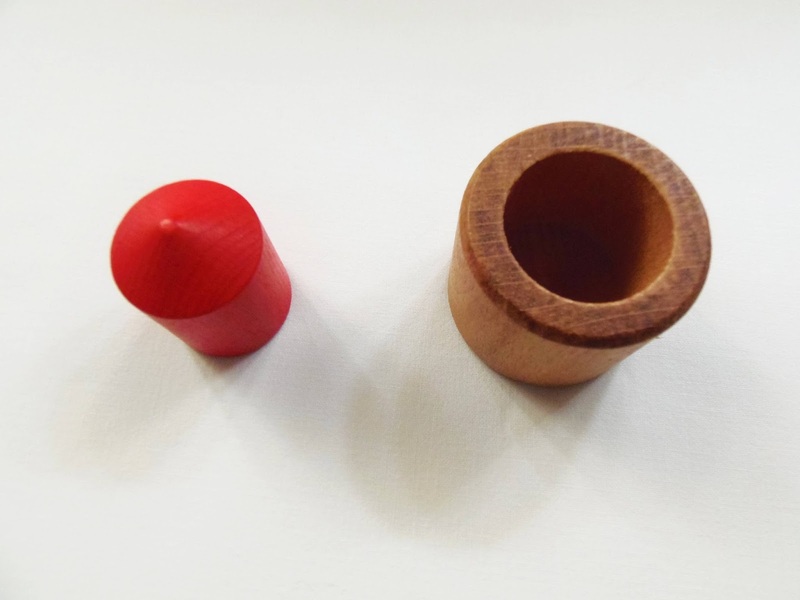 Two small wooden pieces, a cup and a bullet, work together to create a basic physics principle. However, you don't need to be a physicist to discover the solution to Newton's puzzle, but a resourceful mind will help. 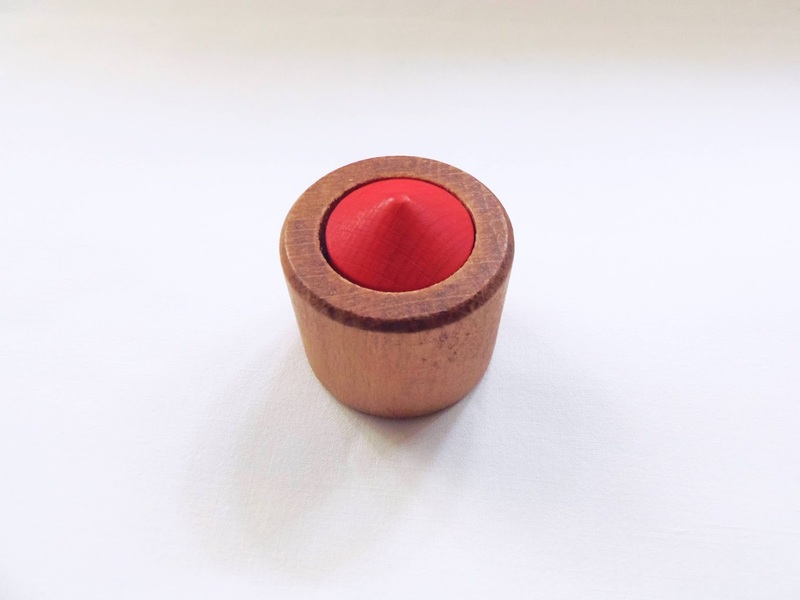 The puzzle is quite small and fits in the palm of your hand, measuring about 4.5cm (about 1.8") in diameter. Newton's Gravity's goal, like its presentation, is as simple as it gets: you have to put the bullet inside the cup and then find a way to remove the bullet without moving the cup. This looks like an impossible task, since at first, your only idea to accomplish this is to tilt the cup upside down, but that's exactly what you're not supposed to do. How is this done then? Ok, I must confess, this puzzle had me baffled for a while and I couldn't resist looking up its solution. I just couldn't figure out how to remove the bullet without moving the cup. It seemed to defy logic and rational thinking. I suspected there should be a trick involved, as some kind of illusion. Well, as it turns out, the solution is indeed some sort of trick, and knowing now how it's done, I reckon it would be a while before I could come up with such a creative solution. It's not an obvious or intuitive solution, that much I can tell you. Without revealing much of the solution, I can say that the puzzle doesn't need to be exclusively on a flat surface. You can be holding it in your hands while performing the solution. Also, the solution involves some sort of propulsion, but that's about as much information I can give you without completely revealing the solution. It is very clever and simple, but can be quite difficult to discover it. I have to disagree with the 2/5 difficulty rating, though. 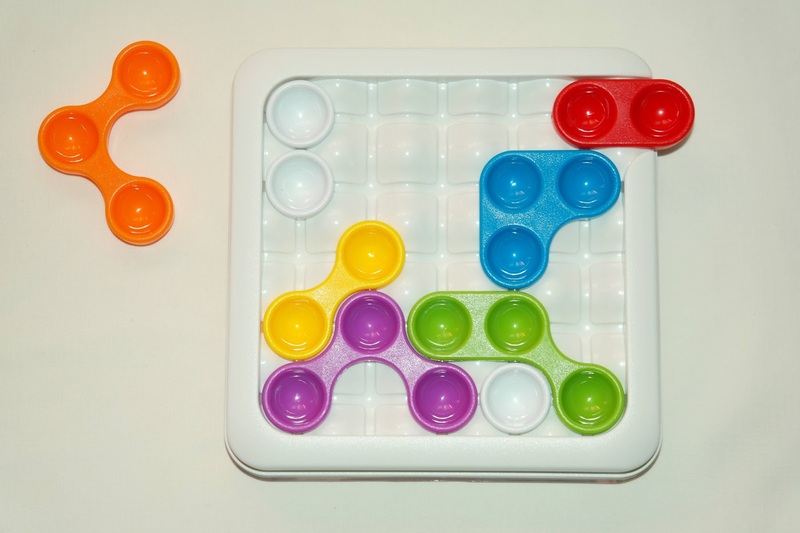 I believe this is much more difficult than the designers made it out to be, even for experienced puzzlers. You won't find too many people out there that will be able to solve this in a timely manner. This is a level 4/5 at least, in my opinion. Newton's Gravity is a perfect puzzle for a party, with lots of friends and family. Challenging people and observing how they try to solve it is probably more entertaining than many other collective activities. 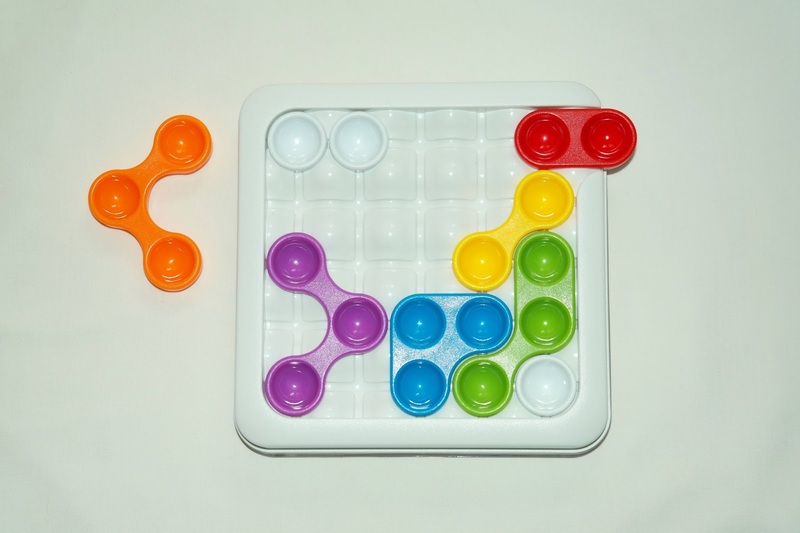 Availability: You can find the Newton's Gravity at Brilliant Puzzles for just $5.99 USD.